Most women (and some men) do not care for their extra body hair. For women dealing with PCOS or some other hormonal condition, excessive hair is too often the sad norm. However, do we really know the difference between having PCOS hirsutism and having vanity? There is nothing wrong with wanting to be hair-free in certain places; it is a staple of beauty in many societies. But what does and does not require medical attention must be determined to set up a successful treatment plan for your PCOS caused hirsutism. Hirsutism, as most “cysters” know it, is the appearance of female facial and body hair growing in patterns usually seen only on men. But understand, we are animals and have some degree of hair covering most areas of our bodies. Regardless of your ethnic background, these hairs are usually very fine hairs that almost appear clear. Vellus hairs are fine hairs that grow all over your body and even appear on your face (i.e. upper lip, sideburns, jaw, neck) in the form of what some would call “peach fuzz.” Vellus hair starts growing on us in the womb and stays throughout our lives. This hair is different than terminal hairs, the thick, dark body hairs that are common in women with PCOS or genetic hirsutism. So, how do you know the difference? How do you know if you should get on an anti-androgen regimen or if you should accept the fact you are a slight furball like the other species of Mammalia? Have an honest conversation with your body hair. Is it mostly vellus, almost clear and peach-fuzz-like? If so, you likely do not have hirsutism. 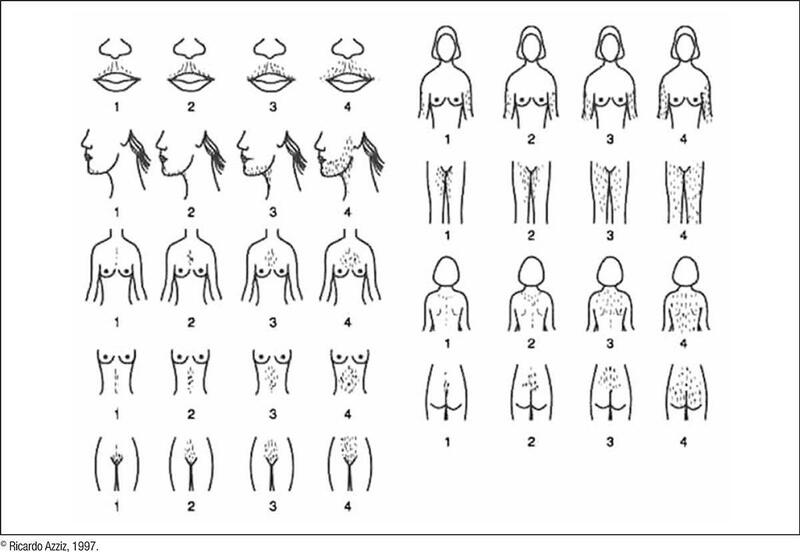 If you do have varying degrees of dark terminal hairs on your body, use a Ferriman-Gallwey chart, like the one below, to determine how hairy you are. Obviously, the higher the number, the more hirsute you may be. If you find yourself having high numbers in the face, bikini area, chest or back, you could have hirsutism. Go see a doctor (especially an endocrinologist) for an official examination and diagnosis. The doctor may ask you disrobe so he or she can examine your body for any appearance of excessive hair growth. From it, they may order blood tests be done to see if you do not have a more serious underlying problem causing the hirsutism. However, if they do not see any of this, they may or may not pursue blood work or recommend laser hair removal services and will likely send you on your furry way. Again, there is nothing wrong with being vain. Everyone wants and deserves to feel beautiful. But there simply may not be a medical treatment for your “vanity” because your body hair was deemed normal. Besides, there is always laser hair removal, electrolysis, makeup and other means to hide the hair.